75259 Snowspeeder - 20th Anniversary Edition is a Star Wars set released in 2019. 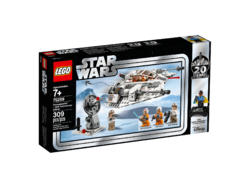 Mark a true milestone in LEGO® Star Wars™ sets with this 75259 Snowspeeder – 20th Anniversary Edition. This special-edition set is an updated version of the original 7130 Snowspeeder model released in 1999 and features an opening cockpit with space for the Luke Skywalker and Dak Ralter minifigures in pilot suits, laser cannons, a spring-loaded shooter under each wing, plus a stud shooter and harpoon with string at the rear. This commemorative LEGO Star Wars building toy also includes an elevating and rotating gun tower with stud shooter for epic Battle of Hoth action from Star Wars: The Empire Strikes Back, plus a bonus Lando Calrissian minifigure from 2003 on a 20th anniversary display stand. Includes 4 LEGO® Star Wars™ minifigures: Luke Skywalker and Dak Ralter in their pilot outfits, a Rebel Trooper and a bonus anniversary Lando Calrissian on a detachable display stand. Features a Snowspeeder building toy with opening 2-minifigure cockpit, 2 spring-loaded shooters, a stud shooter and harpoon with string at the rear, plus an elevating and rotating gun tower with stud shooter. Weapons include Lando Calrissian's original blaster, Luke's blaster pistol and blue Lightsaber, and the Rebel Trooper’s blaster. This LEGO® Star Wars™ construction toy is a reinterpretation of the 7130 Snowspeeder vehicle from 1999 and makes a great LEGO Star Wars gift for builders of any age. Lando Calrissian minifigure is a reproduction of the original minifigure from 2003 and includes a 20th anniversary logo. Connect the LEGO® Star Wars™ 20th anniversary minifigure display stands for the perfect collector's item. Play out unforgettable Battle of Hoth scenes from Star Wars: The Empire Strikes Back and other scenes from the Star Wars™ saga for creative play. Snowspeeder model measures over 1” (5cm) high, 7” (18cm) long and 5” (14cm) wide. Gun Tower measures over 3” (8cm) high, 2” (6cm) wide and 2” (6cm) deep. 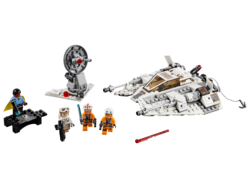 Facts about "75259 Snowspeeder - 20th Anniversary Edition"
This page was last edited on 11 April 2019, at 09:10.